In the field of psychology, curiosity is a cognitive and behavioral quality that is critical in the investigation of emotion and motivation. The phenomenology of curiosity has wide-ranging implications on a variety of human-centered fields, particularly UX design, because it is such a powerful motivating factor. People will take great risks and endure negative repercussions just to satisfy urges of curiosity, and thus it is crucial for UX designers and researchers to understand the phenomenon in greater detail. Historically there has been a lot of debate on how to define curiosity, with some theorists contending that it arises due to rewards for resolving uncertainty and others asserting that there is innate pleasure derived from curiosity-driven behavior. A new study by psychologists at George Mason University (The five-dimensional curiosity scale: Capturing the bandwidth of curiosity and identifying four unique subgroups of curious people) gives us a greater understanding of the roots of curiosity. The study found evidence of five different types of curiosity and four different types of curious people. This research has enormous implications for UX design, because it creates new opportunities to understand the motivations and desires of users, it offers insights into how to design human-computer interactions that align with users’ natural curiosity. Acting on feelings of curiosity satisfies a drive to expand knowledge, build new skillsets, inspire creativity, and even bolster social relationships. Expanding on the simplified definition of curiosity as a strong desire to know or learn something, these behavior traits suggest that curiosity can be more clearly defined as “the recognition, pursuit, and desire to explore novel, uncertain, complex and ambiguous events” (Kashdan & Stiksma, et al. 2017). While these facets have their strengths, they don’t describe every aspect of curiosity. For instance, curiosity can also be distinguished as either a desire to know for its own sake (interest), or a desire to know because of the frustration of not knowing (deprivation). This distinction is critical for UX design because in many cases we are designing for users who are not exhibiting curiosity for deriving pleasure, but rather to resolve uncertainty and confusion. These are two very different types of motivations. There are still other types of curiosity, such as thrill-seeking, creative thinking and social curiosity. These also have important implications in UX design, as the curiosity exhibited by a risk-taking entrepreneur, an artist, or a frequent user of social media may not be driven purely by general interest or deprivation of knowledge. The objective of the most recent study by Dr. Kashdan and his colleagues was threefold: First was to synthesize the research and build a unified framework to define the qualities of curiosity with specificity. Second was take into account the rapid assessment that individuals perform to determine whether A.) a situation has potential to satisfy curiosity, and B.) any negative consequences of pursuing investigation is worth the reward. Third is to approach social curiosity as a distinct dimension, because social relationships are the fabric of human life. I won’t dive into the specifics of the research methodology and analysis, but you can read it here. Joyous Exploration – The recognition and desire to seek out new knowledge and information, and the subsequent joy of learning. We can look at this as curiosity for curiosity’s sake, and we e see this exhibited clearly in the ways in which most children learn, and why they incessantly ask “why?” We also see it in many adults. Deprivation Sensitivity – An emotional curiosity driven more by tension and hard labor than by joy, such as pondering complex ideas, solving difficult problems, and striving to diminish gaps in knowledge. Learning new things and acquiring new skills satisfies a curiosity to continuously master new things. People like this often feel a sensitivity to being deprived of challenges. It’s why people do puzzles, take non-degree adult learning classes, and feel satisfaction in learning new skills. Stress Tolerance – The willingness to embrace the stress and ambiguity of exploring new, mysterious or risky experiences. This is the primary driver of people who love to travel and experience new cultures, or go wilderness trekking, even with the discomfort and stress that comes with it. Social Curiosity – The desire to know what other people are thinking and doing by listening to, talking and socializing with other people. People like this love gossip and love to eavesdrop on conversations and observe behavior. They’re not merely nosy; they’re natural anthropologists. Social media and celebrity gossip, for example, feed social curiosity. Thrill Seeking – The willingness to take physical, social and financial risks in order to acquire new experiences. You can think of extreme sports, but this also applies to serial entrepreneurs and stand-up comedians. You can think of it as curiosity of the thrill. Fascinated – score high across all types of curiosity, especially Joyous Exploration. Problem Solvers – score high in Deprivation Sensitivity, and medium across the rest of the spectrum. Empathizers – score high in Social Curiosity, and medium across the rest of the spectrum. Avoiders – score low across the whole spectrum, especially Stress Tolerance. Remember that Stress Tolerance is the willingness to embrace stress and ambiguity to acquire new experiences. Avoiders seem particularly repelled by this. Some other interesting personality traits emerge from these profiles. For instance, the Fascinated type tends to be extroverted, exhibits low stress levels, and on average has a higher income. Problem Solvers tend to be more introverted, are highly driven and score lowest in apathy of all other types. Empathizers tend to be extroverted and are more likely to be women, and exhibit high usage rates of social media. Avoiders tend to have the lowest education levels and lower incomes, and the highest stress levels. These type of data have enormous implications for user research and UX design. Indeed, as a design tool it may be at least as if not more useful than other common methods of personality analysis such as the Myers-Briggs Type Indicator. To make these findings an effective UX research and design tool, I created a chart that I call the Curiosity Matrix. This matrix can be used in user research to better understand user personality types and motivations, both quantitatively and qualitatively. Answers to questions in user interviews and surveys can be scored on a 5-point Likert Scale, but qualitative answers should also be recorded as a holistic ethnography. Keep in mind that scores will not always align exactly as indicated in the Curiosity Matrix above as curiosity types are more like tendencies on a spectrum rather than absolutely defined. Questions that can be used to evaluate a user’s curiosity type may include (but should not be limited to) the following examples. Users should be asked to score themselves on a 5-point Likert scale (1=Strongly Disagree, 2=Disagree, 3=Neutral, 4=Agree, 5=Strongly Agree) as well as give qualitative answers, and the researcher may ask follow-up questions for clarity. I frequently read or seek out knowledge for no immediate reason. I watch documentaries on topics that are not work or school related. I enjoy tackling difficult problems that mentally stretch me. I frequently take classes, read or use other methods to learn new skills. I frequently travel to new exotic locations. I’m excited by a new experience where I don’t know what to expect. I frequently eavesdrop on conversations between strangers. I frequently use social media (i.e. several times per day every day). I frequently take risks in business and/or social situations. By identifying the types of curious people for which we are designing, we can create more coherent and compelling experiences. Curiosity is a powerful motivator with users, whether it’s in the drive to acquire knowledge and experiences, the need to close gaps in knowledge, the desire to understand what other other people are doing and saying, or the thrill of “what will happen if I do this…?”. Due to its importance in understanding human psychology and behavior, the Curiosity Matrix should be a standard datapoint in user research and user persona creation. This entry was posted in Science + UX, UX Design on February 16, 2018 by Editor. In an interview at Singularity University’s Exponential Medicine in San Diego, Leslie Saxon, founder and executive director of the USC Center for Body Computing, spoke about the Virtual Care Clinic her team is building. The concept for the Virtual Care Clinic was created in 2015 and has since been the team’s vision for how to create a better future of virtual patient care. Everyday technologies like cell phones, smartphone sensors, cloud storage, and data analytics are playing a critical role in Saxon’s vision. “We now have technologies that can scale and that are in enough people’s hands. We have analytics that can deliver accurate information to people and collect accurate information from them,” said Saxon. Saxon is most excited about leveraging technology to increase patient participation and form a partnership between the care provider and patient, which enables more personalized and continuous care. She believes these are critical components to improving our current model of patient care, where patients are often disconnected and uninformed. Ultimately, her hope is to create a global network of health experts that is accessible to all. This article originally appeared on Singularity Hub, a publication of Singularity University. This entry was posted in Design, Health, UX Design on February 9, 2018 by Editor. In an interview at Singularity University’s Exponential Medicine in San Diego, Nichol Bradford, co-founder and executive director of Sofia University’s Transformative Technology Lab, explored how new technologies are being designed to enhance emotional wellness and awareness. Sofia University’s Transformative Technology Lab is certainly a unique space in Silicon Valley. The lab exists specifically to support entrepreneurs and innovators who are building new health and wellness-focused tech in an emerging field called transformative technology. Bradford explains that within our psychological experience, or our wellness spectrum, there are a variety of technologies that can support specific conditions, such as anxiety, stress, and depression. One of Bradford’s favorite examples is an app called Ginger.io, which provides emotional support coaching and uses AI for pattern recognition in its users. “With their permission the app performs a bit of phone monitoring and establishes a baseline for the user,” Bradford said. Bradford is most inspired by products like this, where user data is gathered then fed back to users in a way that helps them develop a higher level of self-awareness. Bradford is also interested in companies that are using neuro-stimulation and biofeedback. She gave the example of a new FDA-approved electro-stimulation device by a company called Fisher Wallace. The device straps to a user’s forehead and is proven to effectively reduce depression without using traditional drugs. One of Bradford’s key messages is that humans take direction and coaching really well, and that we should optimize technology around this notion. This entry was posted in Design, Design for Good, Health, UX Design on January 25, 2018 by Editor. You may have to use up to 17 dongles with your new MacBook Pro. The release of the new MacBook Pro computers with the Touch Bar feature has not gone smoothly for Apple. Chief amongst the problems with this latest iteration of Apple’s flagship portable computer is poor and inconsistent battery life, the primary reason why Consumer Reports for the first time initially did not recommend the laptops. Consumer Reports has since changed their recommendation after Apple released a fix. But even with this problem apparently corrected via a software update, there are other serious usability problems, as well as a user base that is largely underwhelmed with the lack of innovative improvements that could actually improve the user experience. The reduction of ports down to just two or four Thunderbolt 3 ports on the 13” and 15” models respectively seriously hampers how professionals use the MacBook Pro. There are still too many hard drives and other peripherals and input devices that use USB and FireWire to be thrown away and replaced. Users can purchase expensive adapters for all their externals, but forcing users to buy and use a pile of dongles is clunky, terrible UX. The Touch Bar was the most vaunted new feature on the revamped MacBook Pro. It’s essentially a second small touchscreen display that replaces the function keys, allowing for customization of the UI for different software applications. Apple calls this “A revolutionary new way to use your Mac.” However cool this may look, it seems to create more usability problems than it fixes. First is that using the Touch Bar for executing certain tasks is slower than using keyboard shortcuts because as a flat touchscreen it has no tactile feel. The user must take her hands off the keyboard and her eyes off the screen to look at and use the Touch Bar, thus disrupting their workflow both physically and psychologically. Ten of my students currently have MacBook Pros with the Touch Bar, and all of them report that they thought the feature was cool at first, but stopped using it because it was slow and not very useful. Contributing to this degradation in speed and efficiency is the fact that the Touch Bar changes functionality when you switch software applications. While customization might seem like a powerful feature, it’s long been a well known fact in the HCI field that one of the most common causes of user error is what’s called ‘modality changes’, i.e. when the functionality of an interface element with the same look and/or location changes it’s functionality depending on what mode the software is currently in. One of the ways that professional or power users achieve greater speed and proficiency is by committing commonly used functions to subconscious muscle memory, so that for instance a user doesn’t have to think too hard or look at the keyboard to hit ‘Command-S’ to save a document, they just do it automatically. If, however, ‘Command-S’ functioned as ‘Save’ in Pages but in Keynote created a shape then users would be prone to making errors by accidentally hitting ‘Command-S’ in Keynote when they intended to just save their document. Further, users would have to work more slowly and think about what modality the software is currently in. I have observed this with my students: they stop, look at the Touch Bar, and have to think about how to use it every time. A quick ‘Command-Tab’ switches applications, and therefore modalities. That’s why they quickly stopped using the Touch Bar: it’s bad UX, especially for power users. Collectively, these all add up to the MacBook Pro creating more problems than it solves. So below I’ve outlined features and functionalities the MacBook Pro could have to make it a really innovative, powerful, and most importantly user-friendly portable computer. And let’s also keep in mind one more important thing: not one single professional user has ever told me that they really need their MacBook Pro to be thinner and lighter. Apple seems to be obsessed with this. Pro users are not. First of all let’s ditch the Touch Bar. It doesn’t seem to serve any of these user needs, and creates usability problems rather than solving them. Next let’s focus on memory. Pro users need lots of memory to run applications and store large files, and although Apple wants people to pay for their cloud services, this doesn’t work for how pro users actually work. Let’s make the standard base-level memory 16GB of RAM (upgradable to 32GB or 64GB) and hard drive storage starting at 1TB (upgradable to 2TB or 3TB). Pro users have evolving storage needs. Let’s make both RAM and HD memory user upgradable. To help pro users work more quickly and efficiently, Apple should design add-ons for their pro software such as Final Cut Pro and Logic Pro. These can include keyboard overlays that teach keyboard shortcuts (proven efficiency boosters) and different types of mouse-like input devices specific to these softwares. Many pros use tablets for a more tactile input device experience. Apple should follow the route of Microsoft and others by giving the MacBook Pro a touchscreen display with stylus. They already have something like this with the iPad Pro, but iOS doesn’t run most of the professional software. Let’s bring that iPad Pro functionality to the MacBook Pro. Speaking of the iPad Pro, let’s make it interoperable with the MacBook Pro by making the iPad Pro a portable dual display option. Let’s allow users to connect an iPad to the MacBook Pro and use the iPad as a second touchscreen display. The Microsoft Surface Pro can’t do that…yet. Pro users already may have to connect multiple external devices to their MacBook Pro. Let’s not make that even clunkier than it already is by forcing them to stick a bunch of dongles between the computer and the externals. Let’s create a customizable, modular port bay on one side so the user can choose between these two options: three Thunderbolt 3 ports + 1 USB-C port —OR— two Thunderbolt 3 ports + one USB-C port + one FireWire 800 port. And let’s add back the SD card slot for pro photographers and videographers. Durability is something that is not usually a priority with the industrial design of computers, but so-called ‘Tough PC’s’ have been around for a long time. So let’s really set the MacBook Pro apart from the competition by making it waterproof (to one meter…let’s be reasonable), dustproof and shockproof. To design great products that are usable AND innovative, Apple needs to use the UX process to understand it’s users, design to their needs, and test extensively. Ultra-thin laptops with Touch Bars are neat, but they don’t solve any usability issues and don’t serve the needs of professional users. Beautiful aesthetics can deceptively mask poor usability as explained in this excellent article on The Aesthetic-Usability Effect by Kate Meyer. A beautiful, ultra-thin laptop with a not-very-useful Touch Bar and a bunch of dongles hanging off of it isn’t innovative, and it’s not good design. This entry was posted in Design, UX Design on February 2, 2017 by Editor. We are living during a period of history defined by uncertainty. Global climate change, political and social upheavals, demographic shifts and other large scale changes mean that past trends do not necessarily predict future ones. But this is also a period when design as a field is more prominent than ever, giving us tools to innovate in the face of challenges with uncertain outcomes. A primary design goal with these really big challenges should be resiliency. Resiliency is a kind of strength. It allows objects to hold their shape, and people and organizations to remain intact under duress. To design resiliency we cannot just devise solutions to current challenges; we must also anticipate future challenges, and this requires futurecasting. Futurecasting is not about predicting the future. This is a fool’s errand, yielding results that are almost certainly inaccurate. When I was growing up, magazines like Popular Science promised flying cars and personal robots in the 21st century. (I’m still waiting for mine!) Instead, futurecasting is about sketching possible future scenarios based on current trends across a wide range of disciplines including science, technology, social sciences, economics, environmental and energy trends, etc. Instead of viewing the future as a single linear pathway, it uses systems-based thinking to envision multiple possible scenarios from best-case to worst-case possibilities. Climate change is already happening, and the latest data suggest that it started earlier than previously thought. Many scientists also believe that the recent Paris accord is too little, too late to stop human-caused climate change. While there is promise of technology-based solutions to the problem, these will take time to both come on line and begin to take effect. So we can say with a high level of probability that many of the predicted effects of climate change are inevitable, and some— such as sea level rise, drought in some areas, flooding in others, and increased storm activity— are now unavoidable. Designing resiliency to climate disruption thus becomes of paramount importance. To be clear, what we are talking about here is weak AI. We are a long way off from building a self-thinking, self-aware, sentient AI, and we really don’t know how long it will take or if it’s even possible. We are held back less by computing power and more by the fact that we don’t have a clear understanding of the inner workings of consciousness or sentience. It’s pretty hard to build something when you don’t know what you’re building. However, weak AIs are going to have an enormous impact in wealthy countries in the next decade. A new development that is coming quickly is the personal AI avatar, a weak AI that acts as a personal assistant. It will filter information for you, customize your news feed, manage your personal and professional communications, and predict your needs and desires. These personal AI avatars will be gateways to access consumers. Some companies will design and customize the avatars. Others will negotiate with the avatars to deliver ads and marketing materials. Organizations need to understand how this technology works. Objects with embedded computers and wireless connectivity, the ‘Internet of Things,’ will proliferate, and increasingly these objects will interface with weak AIs that live in the cloud. These will also interact with personal AI avatars. For instance, your avatar will know when you wake up and will tell your coffeemaker to start making coffee. Your printer will tell your avatar that your ink levels are low and then your avatar can order new ink from Amazon without bothering you. Rather than just designing individual products, organizations will be designing product ecosystems, and there will be no difference from a design standpoint between digital and analog experiences. Another area that is seeing revolutionary change is transportation design. Enabled by weak AI, autonomous self-driving cars will become the norm in the next decade. That doesn’t mean everyone will drive one, but we will all share the road with them. Just like with the Internet of Things, experience design will be critical in how we interact with transportation, from cars to buses, trains and aircraft. Already, companies like Tesla, Hyperloop, SpaceX, Toyota, Honda and others are hiring UX designers to do the design work that used to only be done by ergonomics engineers. This is because people don’t just interact with their car or other vehicle, but are interacting with multiple hardwares and softwares both inside and outside the vehicles. Organizations working with transportation will need to think of their products and services more like digital devices and software-as-a-service rather than traditional transport. We are in a cyberwar. Right now. The recent hacks of government email servers and the DDoS attacks that brought down sections of the internet in October, 2016 were skirmishes in this war. This war is very complex because some of the players are governments and some are private parties, but it’s often very hard to tell the difference. This war will affect everyone using the internet and connected devices, so organizations need to know what’s going on and have a strategic plan. The recent DDoS attacks were especially significant because instead of using desktop or laptop computers to launch the attacks, they used other devices, like home internet routers and webcams. All of those Internet-of-Things devices are actually computers with wireless connectivity, and they are all vulnerable to cyberattack. For decades cybersecurity and anti-virus efforts have always been a step behind hackers. Humans are a bottleneck in these efforts, and so the only way to be able to respond and defend against these attacks quickly enough to be effective is to use defensive Weak AIs. On the flip side, AIs can also be weaponized and used to launch attacks. Again, because AIs have an enormous speed advantage over humans, such an attack could be very damaging. Hackers know this, and so an attack with a weaponized AI is almost certainly inevitable. Organizations need to have a cybersecurity strategy, and AI needs to be a part of that strategy. For individuals, personal AI avatars will not only be our assistants but also our bodyguards against hacking and identity theft. With AIs being the new defensive and offensive weapons in the cyberwar, experience design is critical to being able to effectively utilize them and to understand what is happening. Experience Design (XD), UX, and Design Thinking are becoming the biggest forces in all fields of design and business. This is because they work as effective methods for solving big, complex problems with human-centered solutions. XD/UX combines the creative ideation and sideways thinking of design, critical for coming up with innovative solutions, with the empirical rigor of science, critical to validating whether a solutions works or not and why. Studies indicate that startup businesses fail 80-90% of the time due to XD/UX failures, which include things like lack of a market need, being beaten by competition, poor product design, ignoring customers, etc. XD/UX is critical for business. Increasingly, XD/UX is designing not just single products but product-service ecosystems. The empirical iterative process of XD/UX is particularly well suited for tackling big complex problems using design thinking and systems thinking. In this time of uncertainty, there are unique opportunities for innovation. The organizations that are best prepared and well positioned will have a distinct advantage in those opportunities. By leveraging design thinking and XD/UX, organizations will have the critical elements to design solutions to climate disruption, AI, and cybersecurity. Futurecasting may at first sound more mystical than meticulous, but only by putting in place a proactive forward-thinking strategy can organizations design resiliency. This entry was posted in Creative Leadership, Design, Future, UX Design on November 13, 2016 by Editor. 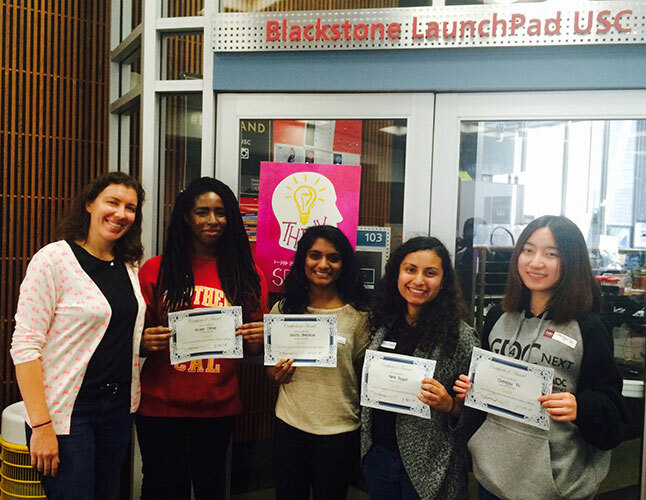 The winning UX team, from left to right: Sarah Dzida (mentor), Alison Omon, Nikita Dhesikan, Kenia Duque, and Lowrie Fu. On April 25th, 2015, UXSC (the student UX design group at the University of Southern California) staged a Designathon, a shorter version of hackathon tailored to user experience design. The Designathon, held at USC’s tech incubator facility The Blackstone Launchpad, was open not only to students but to anyone who wanted to participate. Teams were formed the morning of the event, and each team was mentored by UX design professionals who helped them with the design process. Common frustrations that students face with current online tools include having to open multiple tabs to see what courses to take in one semester (OASIS, Ratemyprofessor, Google Calendar, etc. ), the overhead in remembering the specific classes that are needed, and being forced to start over when there is an enrollment error, such as not meeting the prerequisites for a class. These frustrations require students to spend many hours of time at tasks that should be much simpler, and the causes of these frustrations may also lead to students making errors in their course selection and academic planning, negatively impacting their overall university experience. 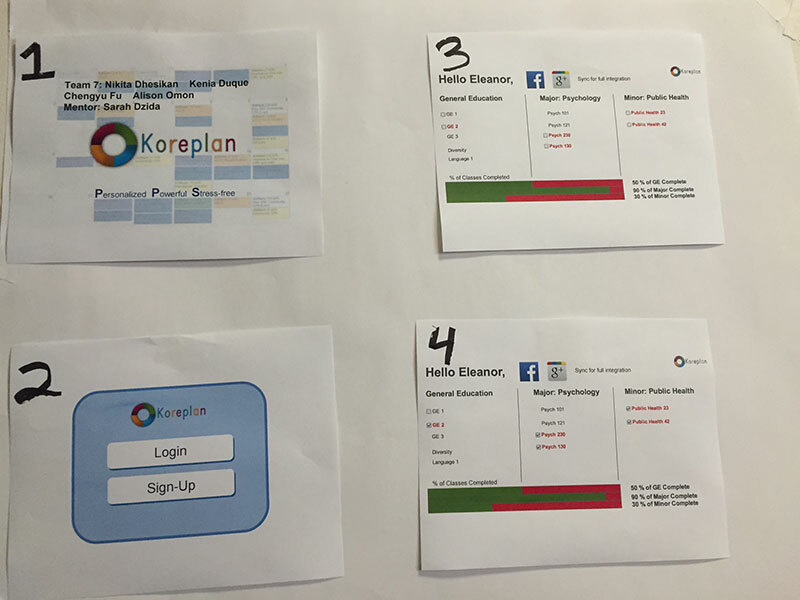 The team’s solution was to have a student log into Koreplan where their dashboard would show their remaining classes and the progress they have made to their 4 year plan. The student clicks on a few classes from their Major, Minor, or GE course lists, and Koreplan makes a few schedules with the combination of classes. The class sections have a table of details where a student can see if any of their Facebook friends are also enrolled in the class, and the rating of the professor teaching the course. Once a student has chosen their desired school schedule, they can integrate it with their personal calendars such as Google Calendar, iCal, etc. 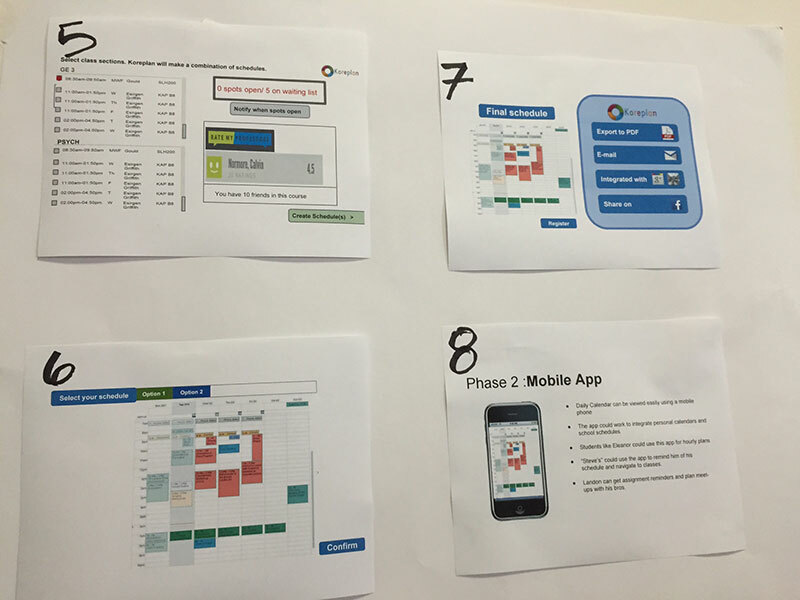 The team focused on three primary user personas, representing a freshman student, a junior student and a senior. Although they did not develop a persona for a sophomore, the personas they did have allowed them to analyze the problems from the point of view of students from the very beginning to the end of their university experiences. 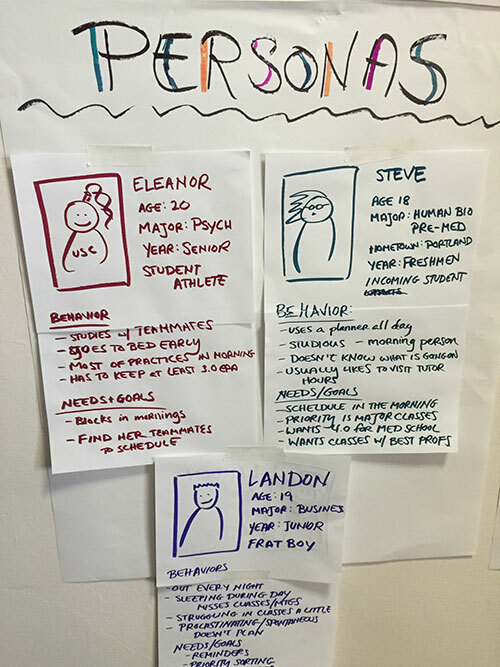 The personas also represented a college athlete, a med student, and a member of a fraternity, giving the designers a broad range of user perspectives. The confusions and frustrations with course enrollment selection and management, and the current lack of a systems-based approach to managing one’s academic career, were clear and universal for students of all types. While there are lots of great digital tools available for students, the lack of a coherent ecosystem for making these tools work together is exactly the problem the team approached. The solution they came up with, Koreplan, is precisely the digital trend that is defining UX design now and will continue to do so over the next five years: not just innovation in a single product, but designing innovative synergies between products. In this way, the Koreplan team not only designed a product that would solve major pain points for their target users, but also leveraged the synergies between existing technologies in a way that was inventive and forward-thinking. This entry was posted in Design, UX Design on June 12, 2015 by Editor. Before launching into the topic of this article, it’s necessary to lay out very clear definitions of what exactly UX and Transmedia are, as these terms get misused far too frequently. UX is short for User Experience. Broadly speaking UX design is a process for designing positive interactions between people (users) and products (often software or websites) and/or other people. Taking a user-centric approach and drawing upon the disciplines of visual design, psychology, and human-computer interaction (HCI) research, UX aims to design not just the visuals and interface, but the entire user experience. While UX is most often applied to software and website design, UX designers are also designing physical experiences like in-store shopping experiences, airport lounges, classrooms for schools, museum and art exhibitions, etc. Defiance is a transmedia tv show and computer game by the Scify Channel. Transmedia storytelling is an approach of developing characters and delivering narratives across multiple mediums using both analog and digital technologies. These can include but are not limited to books, electronic books, films, tv shows, computer games, webisodes, and social media narratives. The transmedia experience for the spectator is to experience and explore a single storyline and character or group of characters unfold across multiple mediums. A prime example is the 2013 transmedia project Defiance, a tv series on the Scify network and computer game. Character development and plot lines flow fluidly back and forth between the tv episodes and the computer game. One is not derived from the other, but rather the story line and characters are unfolding on both, meaning that the tv series and game are equal parts in the Defiance transmedia ecosystem. This is the future of entertainment media, the result of the trend of convergence between media in the first decade of the 21st century, driven by many factors including decreasing costs of CGI graphics for films and tv, the explosion of smart phones as primary tools for media consumption, and the electronic gaming industry surpassing the film/tv industry in revenue and popularity. As I outlined in an earlier article, we have moved past the decade of convergence and are now in a decade focused on synergies, and this is particularly the case with transmedia and UX design. Transmedia opens the door to new kinds of storytelling, and new possibilities for creative expression for authors and media makers. But unlike a book, movie or tv series, software-based narratives such as websites, apps and electronic games need not only compelling stories and characters but also compelling interfaces and user experiences. Transmedia makers need to know good UX design. To begin let’s consider some of the fundamental elements of UX design and how they apply to Transmedia storytelling. The first and most important is that UX design is an iterative rather than linear process. There are different ways to describe and illustrate the iterative process, but here is a simplified version. First designers do research and brainstorm during a learning stage of the process; second they build prototypes during a building stage of the process; and third they test usability and effectiveness during a measuring stage of the process. The process then repeats, as ineffective ideas are jettisoned and the project moves closer and closer to a “finished” state with more and more refined iterations. The iterative design methodology is based on a cyclic process of research, prototyping, testing. Refining the design each time the process is repeated results in improved functionality and effectiveness of the design. This iterative process and rapid prototyping model can also be effective with transmedia design, where story and character development is often collaborative, and the possibilities of how to develop narrative and character across different mediums requires input from writers and media makers with diverse ranges of expertise. The often collaborative, cross-media writing for transmedia has parallels to information architecture in UX design. Writing and editing a story and developing characters, figuring out to best tell the narrative on which mediums, is similar to the process of organizing information and designing simple user interfaces. Again, this is an iterative process, and using a UX design approach to writing narratives in transmedia can lead to better, more effective storytelling by constantly taking a user-centric mindset. What elements of the story are best told via video, electronic game, social media, etc? Rather than thinking of this as screenwriting, it can be thought of as narrative design. The production and testing phase of the UX design process is inherently interdisciplinary, requiring art direction and graphic design, software coding and database administration, and often user testing and metrics analysis, all the while maintaining a user-centric focus. Transmedia, too, would benefit from this approach. Film and tv production is already inherently interdisciplinary, which is why filmmaking is such an inherently collaborative art form. But add in the transmedia integration of games, apps and networked media and there are not just multiple disciplines working together but multiple industries, representing a conceptual merging of Hollywood with Silicon Valley. Transmedia projects would greatly benefit from the UX approach of user-centric design, and design-thinking as part of the creative process. Films tend to be produced, whereas software is designed. It’s time to merge these two sets of thinking, to approach film and tv production as well as software design from both filmmaker’s and designer’s perspectives. With a transmedia product, the moving picture part of the project isn’t separate from the other digital media parts. The Scify channel’s Defiance isn’t a tv show plus a game, it’s a transmedia ecosystem. Transmedia is compelling because it immerses the audience in the story and characters. Rather than being limited to one tv episode per week, viewers can immerse themselves in their favorite stories and engage with its characters any time they like. Rather than being passive spectators, they are active, involved users of transmedia stories. The user-centric, iterative approach of UX design is tailor made for this new paradigm of entertainment media. To be successful, transmedia projects need great UX design. This entry was posted in Design, Transmedia, UX Design on October 14, 2014 by Editor.